Teens prepare organic produce for customers at the the Roberto Clemente Youthmarket in the Hub in the South Bronx on Aug. 29, 2012. GrowNYC’s Youthmarkets is non-profit initiative that brings greenmarkets to underserved communities while providing youth training programs. When Giovanni Edwards and a couple of his high school friends set up a makeshift produce stand in Bed-Stuy seven years ago, they had no idea how big their small market would become.Edwards, 23, co-runs GrowNYC’s Youthmarkets, a non-profit initiative that brings greenmarkets to underserved communities while providing youth training programs. It all started when Edwards, then 16, and his teen-aged friends bought produce from the larger farmers’ markets to sell within their own community. Within the next several years, the teenagers got a partnership with GrowNYC – the nonprofit group that organizes New York City’s greenmarkets. This year, there are 11 youth-run stands throughout the city and at least one in each borough. Today, Edwards is working at one of the 11 Youthmarkets at the Roberto Clemente Youthmarket in the South Bronx that set up shop for the first time in July. Every Wednesday morning, a group of youths gather under a small tent here on Third Avenue between 148th and 149th streets to sell produce straight from of the upstate farms. 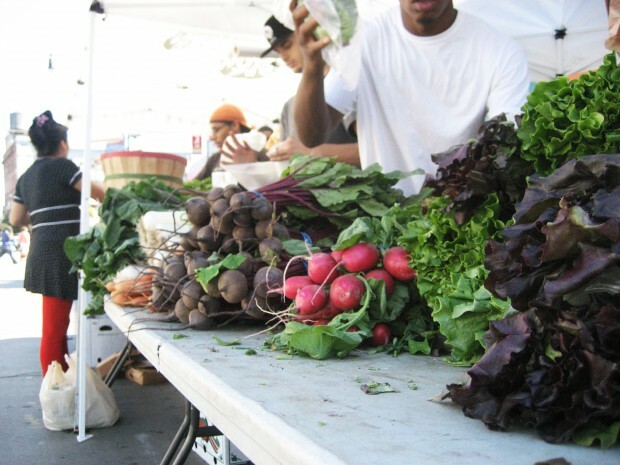 “What separates us from the regular green market is that we work with community partners in the area to bring youth to the market to work with us,” said Jayson Rosado, 19, Youthmarket manager. The Roberto Clemente Youthmarket has been working with about 60 youths from SoBRO, a nonprofit organization in the South Bronx that provides career development opportunities for youth and adults. Since it set up its tent a little over one month ago, the food stand has been already making friends with the local customers. Carmen Whitaker has been taking the bus each Wednesday from her home near the Bronx Zoo to come to the market. With a walking stick in one hand and bags of produce in the other, Whitaker says she keeps coming back because the food is fresh and healthy, and that the service is good. This entry was posted on Friday, October 5th, 2012 at 3:32 pm. It is filed under Print and tagged with City Limits, farmers' markets, food desert, greenmarkets, SoBro, South Bronx, youthmarkets. You can follow any responses to this entry through the RSS 2.0 feed.